There is an art gallery called Jike Studio, which is located in the northern countryside of Yokohama (at Jike-Cho, Aoba-ku). The studio is a venue for showing art works, handicrafts (often coupled with workshops), music performances and surprisingly enough rakugo (comic narrative) performances as well. It has a cozy café on the same premises. I would like to introduce to you the studio’s activities and attractions a little bit more. According to its producer, Harumi Sakagami, the studio started by sheer chance. When an artist living nearby had her studio refurbished, some of her works were temporally kept at a warehouse. Sakagami found that these works were well suited to the atmosphere of the warehouse: so that became Jike Studio. I asked her how she likes to run Jike Studio. To this, she mentioned a recently held rakugo performance at her studio: a rakugo storyteller emphasized that his master had always endeavored to tell something that would touch a person’s soul. She was impressed by this, so she too would like to produce her exhibitions in a way that may appeal to the inner parts of visitors. Second, by Akira Sawaoka on April 2, 2011for a project that he had taken part in. It was about an unmanned spacecraft named “Hayabusa,” meaning a peregrine falcon, which managed to land on a small near-Earth asteroid and collected some samples there, then returned to the Earth in June 2010 after seven years of turbulent space travel (it had critical troubles with engines and the self-stabilizing mechanism). Sakagami of Jike Studio wishes that more people will visit the studio which is frankly speaking not that conveniently located in the Jike area. I hope that I may be able to give some help in this regard. 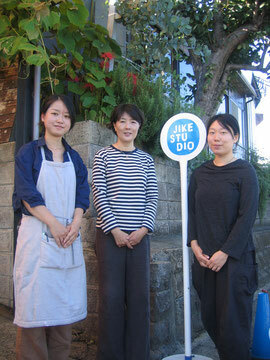 Harumi Sakagami (in the center), the producer of Jike Studio, stands in front of the studio with her staff. I took this photo on October 4, 2012 during the Jike Art and Craft event, which was held from October 3 to 8, 2012. This is an annual event of open studios and workshops that are arranged by ten artists living in the Jike area, including Jike Studio.